Sunday January 1st 1893 The weather was more pleasant. After doing up the morning work we all got ready and went over to Hattie's for dinner. Will took us in the big sleigh. We spent a pleasant day and I did some work more than getting supper after we came home. I read all the evening. 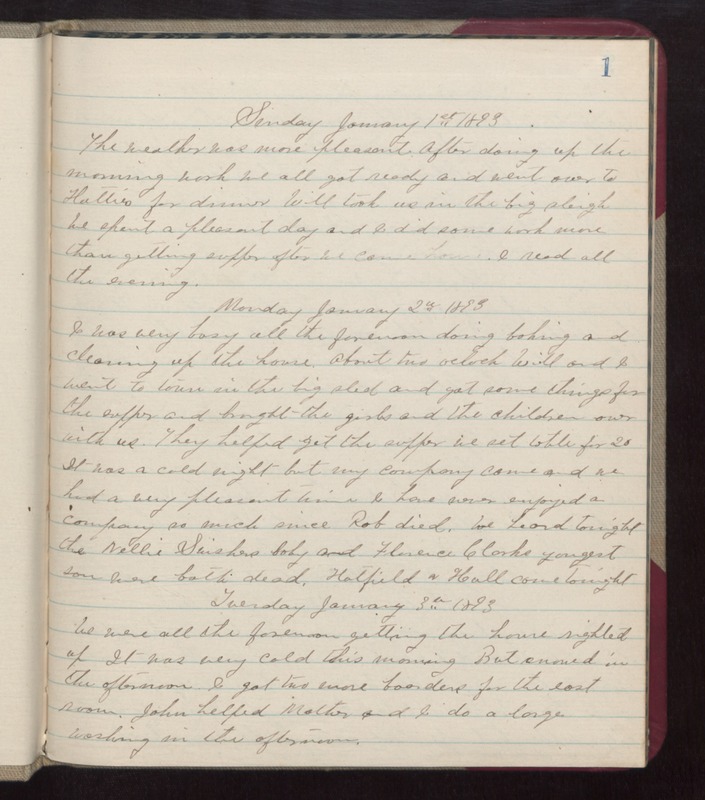 Monday January 2nd 1893 I was very busy all the forenoon doing baking and cleaning up the house. About two oclock Will and I went to town in the big sled and got some things for the supper and brought the girls and the children over with us. They helped get the supper we set table for 20. It was a cold night but my company and we had a very pleasant time. I have never enjoyed a company so much since Rob died. We heard tonight the Nellie Swishers baby and Florence Clarks youngest son were both dead. Hatfield & Hall come tonight. Tuesday January 3rd 1893 We were all the forenoon getting the house righted up. It was very cold this morning But snowed in the afternoon. I got two more boarders for the east room. John helped Mother and I do a large washing in the afternoon.